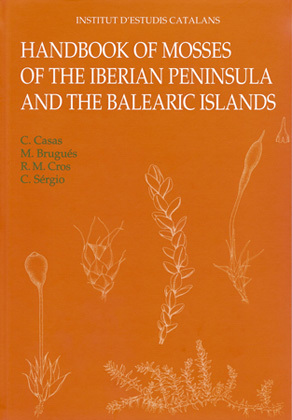 Descarga en PDF HANDBOOK OF MOSSES OF THE IBERIAN PENINSULA AND THE BALEARIC ISLANDS. Illustrated keys to genera and species. Creu CASAS, Montserrat BRUGUÉS, Rosa M. CROS & Cecília SÉRGIO. Illustrations: Anna BARRÓN & Iolanda FILELLA. Translation into English: Elena RUIZ. Revision of the English text: Alan Roy PERRY. Institut d’Estudis Catalans, Barcelona, 2006. ISBN 84-7283-865-X. 349 p.